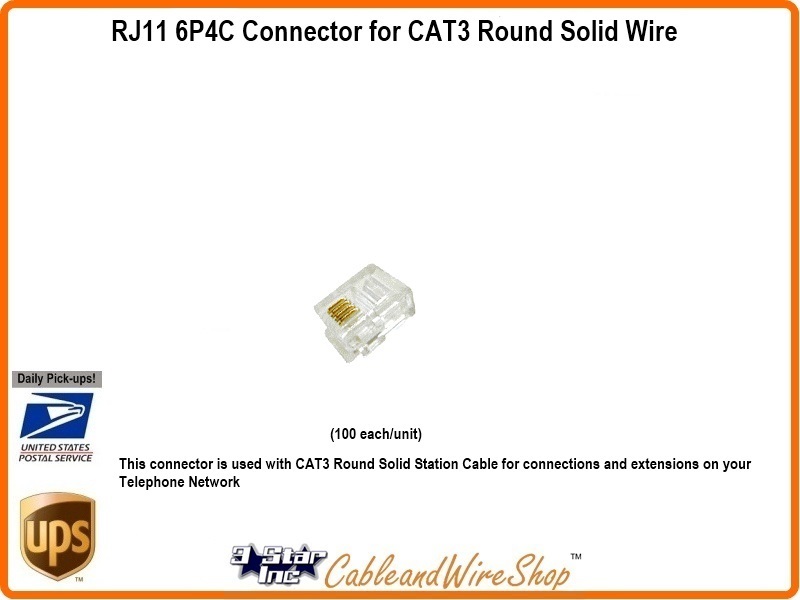 (100 each/unit) This connector is used with Cat3 Round Solid Station Cable for connections and extensions on your Telephone Network. To get started, the first step is to split an existing phone line. Find the phone jack closest to the desired new jack location. Hopefully, there will be one that shares a wall with the new room to be wired. Open up the existing jack and disconnect all the wires. Either drill a hole to the new location, or staple the new wire between the rooms. Connect two of the four wires to the new jack, and the other two wires to the old jack. Typically, this will mean that the old jack will have the red and green wires connected, while the new jack will use the black and yellow. Be sure to tape off the two wires not connected to each jack. While phone lines do not carry high voltage current, there are a couple of basic safety concerns. The low voltage carried over a phone line can still give someone a jolt, so it is best to disconnect lines at the box before getting started. Once the new jack is in place, it is time to run the wire for the phone or fax. Using the crimping tool , remove the protective sleeve on the telephone wire to expose approximately 25mm of cable. Separate the internal cables and lay them out to match the pins on the connectors. Typically, that will leave the Blue and Orange wires connected to pins two and three, respectively. Using the crimping tool, cut the exposed copper core of the wires down to leave about 12mm exposed. Insert the exposed cables into the two center RJ11 slots with copper pins. Crimp the connector to the cable using the tool. Repeat these steps with the opposite end of the cable. The RJ11 line is now ready to use.